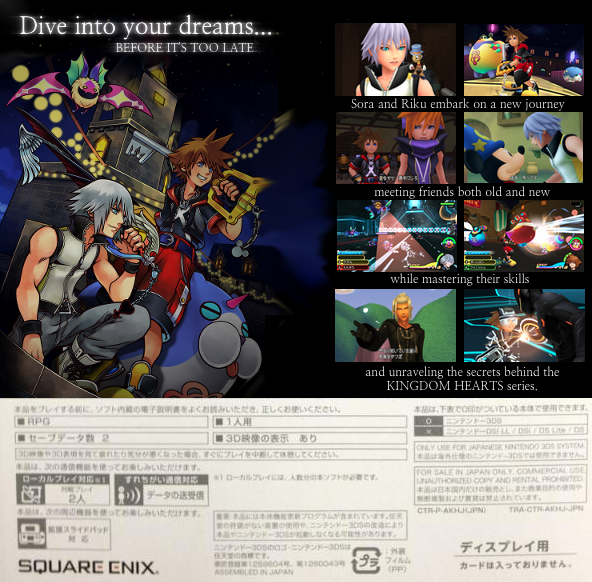 Kingdom Hearts 3D Back-of-the-Box Contest: Final Voting Round! Poll closed Mar 30, 2012 . 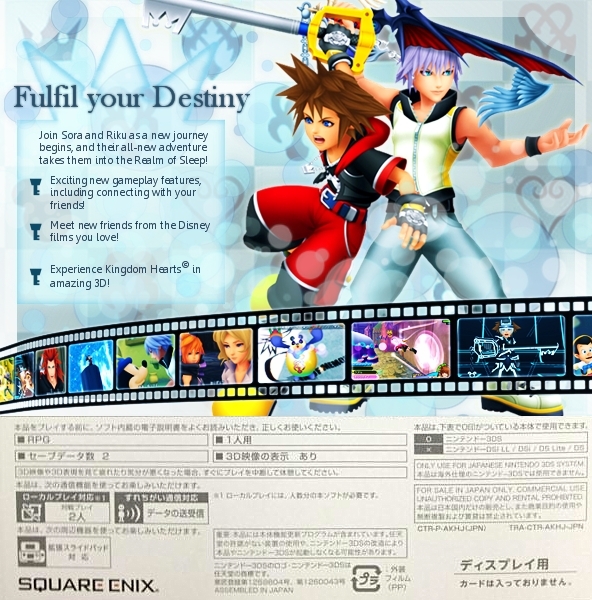 Welcome to the Final Round of Voting for the Kingdom Hearts 3D Back-of-the-Box Contest! Here are your three contestants! Winner will be announced March 28th, 2012 at 8pm PST! 2nd Place Winner will have their pick between three DVDs: TRON: Legacy, Mickey, Donald, and Goofy: The Three Musketeers, or The Hunchback of Notre Dame! Re: KHInsider 2011 Halloween Costume Contest: Final Voting Round! I think Souji Seta has the best back cover; his screen shots were organized in a style reminiscent of past KH titles and he executed everything well. I liked the other entries as well but I'm not a fan of the screen shot placement on one and a word is misspelled on the other. I'm sorry, but I love that back style (it's on the back of KH1 and 2, plus FFX and stuff), so yeah. The others were great too though. Seta got my vote. Not because he's a member of the Moogle Army, but his back box art fits what all the KH back boxs art has been. Soulji's Artwork is very original to the KH series and thats why I voted for theirs. Even though "Showdowns" was also very impressive and newly creative, I just felt loyal to the originality of what "Soulji's" demonstrated. Wish I could vote for them both. Great job and effort from everyone in the polls. The second one looks more like an actual KH box. But the first one is just way too awesome! Ahhh I really want to vote for Seta, but that film reel and typo is top tier. Good job, Showdown. I think Souji Seta , should win this his back art is so basic and clear and feels so right i like the others but there is a lot of errors and its hard to make out the words becuse they did not use the right font. I voted. I don't want to say who I voted for however. EDIT: Sorry, I mean, I congratulate the finalists and I should pay more attention. Grats to these finalists, they're well deserving to be here. 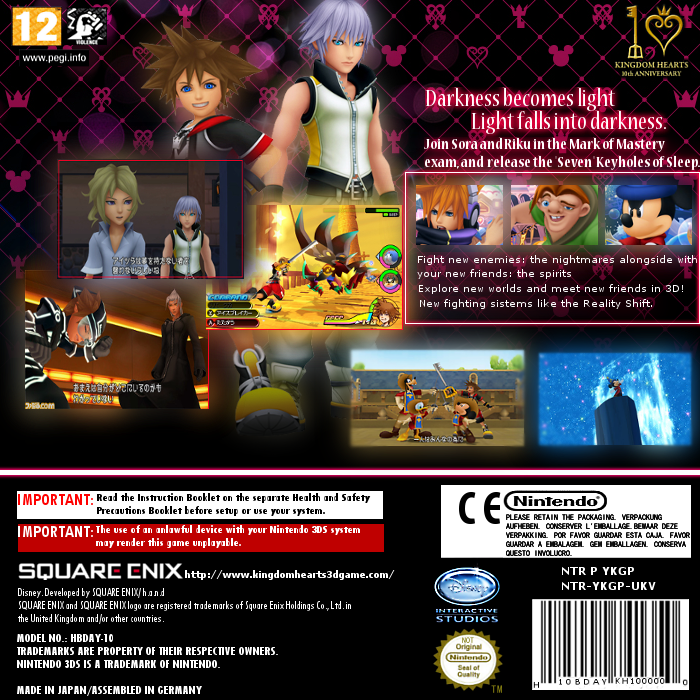 Although I don't think Showdown's is best suited for a KH box, it's by far the most impressive in my opinion, +1 vote . I hope you guys hold more art competitions, this one was a lot of fun! ;D look out for more in the coming months~ We have some really great contests planned for you guys!